Arrive at Damascus airport. Meet and transfer to your hotel for dinner and overnight. After breakfast, drive to the National Museum of Damascus, then head to the old quarter to visit the Folklore Museum, which is a typical 17th century Damascene house. We visit the Omayyad Mosque, and the tomb of the hero of Islam, Saladin. After lunch in a local restaurant, continue on to a street called straight, St. Paul’s window & St. Ananias Chapel. Take in a view of Damascus from 350 meters above the city level. Back to your hotel for dinner and overnight. After breakfast, depart for Palmyra, one of the greatest trading posts on the antique Silk Road. 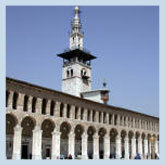 Visit the museum, the temple of God Bel, the monumental arch, the viarecta, the agora, and the tower tombs. After lunch visit Ibn Maan castle to watch the sunset. To the hotel for dinner and overnight. After breakfast, head east to the Euphrates basin to visit the ruins of Dura-Europos, a historical town built by Seleucus Nicator. 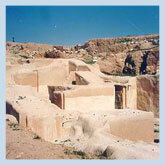 We continue the visit to the archaeological site of Mari, where a great kingdom flourished in the third millenium BC. Over to Deir-Ezzor for dinner and overnight. After breakfast, head upstream to visit Halabia, a fort built by the Palmyreans to look after their affairs in the east. Visit Resafa, a 5th century Chrisitian holy town. You will also visit the Islamic Jabar, castle & Al-Assad dam on the Euphrates. Follow the sunset to Aleppo for dinner and overnight. After breakfast see Aleppo, including the archaeological museum, the citadel of Aleppo, and the Grand mosque. After lunch, visit the bazaars and the caravanseraies of Aleppo. Back to the hotel for dinner and overnight. After breakfast, a morning visit to St. Simeon’s Cathedral. After lunch in Aleppo, drive south through the fertile country side to visit Ebla. Visit Apamea, the main street, Antony & Queen Cleopatra once strolled on this street. Visit the cathedral, the palace and the mosaic museum. Arrive in Hama for dinner and overnight. After breakfast, depart to Homs. Visit Khaled Inb Al-Walid Mosque. Khaled is an Islamic leader, who conquered Syria in the 7th century AD. Visit the church of Um-Alzunar. Continue on to visit the castle in Crac des Chevaliers. Visit Ma’aloula, the picturesque village on Qalamoun mountain. Arrive Damascus for dinner and overnight. After breakfast head south to visit the Basaltic hills and view the great monuments of Sweida, Shahba & Bosra whose enormous edifices built of basaltic stones revel a glorious past. Return to Damascus for dinner and overnight.